MMA Fight of The Year Nominees Part 1 | MMA Fighting Events Videos Techniques UFC Fight Picks and News. With a couple of months left in 2010, it's time to start thinking about the fight of the year in MMA. Like always, there's plenty to choose from, but let's start with a great fight that took place at Bellator 8 between former UFC fighter Roger Huerta and Chad Hinton. This fight went back and forth for three rounds. It was an excellent showcase of all aspects of MMA, stand up, chingasos from all angles and submission wrestling/grappling until the fight finally came to a close with an awesome kneebar submission. Check out the video where it picks up the fight in the third round. What are your nominees? Include a link to a video if you have one. 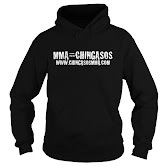 We'll post a poll at a later date and let the Chingasos MMA fans choose!